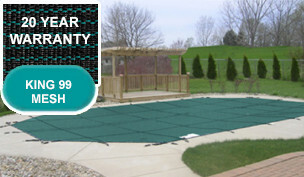 The PoolTux King99 Mesh Safety Cover is the most elegant attire for your pool. But it's not just good looking; it's the highest performing mesh cover they make. This light and tight commercial quality woven material offers many of the benefits of a solid cover, with the handling ease of a mesh cover. The PoolTux King99 Mesh Safety Cover allows rainwater and melted snow to flow through for optimum drainage and safety, but keeps debris out. And, it screens out almost 100% of the sun's ultra-violet rays, which means you'll spend less time cleaning your pool in the spring.